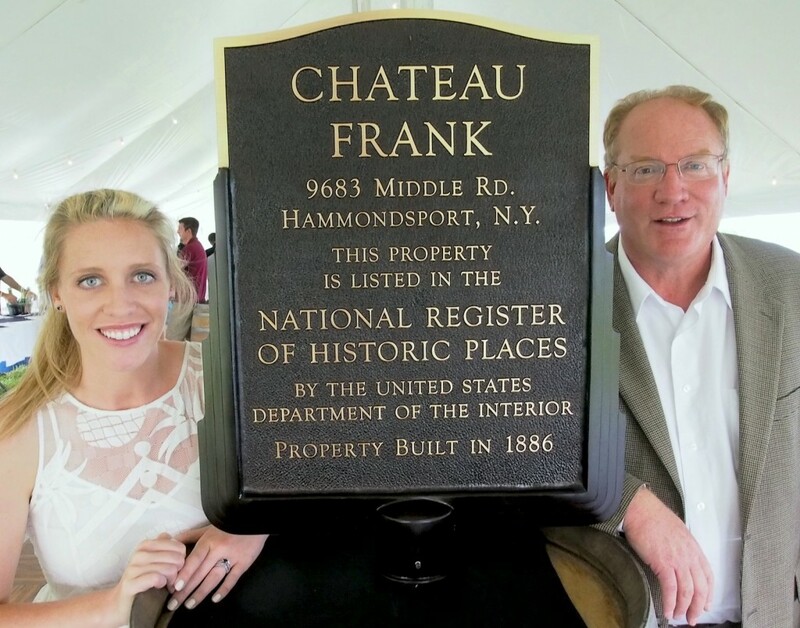 Although the Dr. Frank winery on Kueka Lake celebrated the 30th anniversary of their Chateau Frank sparkling wines today, the 5th of July rather than the 4th, a rumor circulated at the celebration that the US had just declared independence from Champagne! More seriously, Fred Frank (right), the grandson of Dr. Frank founder Konstantin, announced that the Department of the Interior had added Chateau Frank to the National Register of Historic Places. Although the imposing house amongst the vineyards made of local stone acquired it’s present name back in 1985 when the first Chateau Frank sparkling wine was produced, it was built as a winery in 1886. On the left in the photo is Fred’s daughter Meaghan, the fourth generation of the Frank family to work in the winery. She has a strong feeling for the family’s rich traditions, but is determined to, “put my own spin on it.” Her very recent marriage was an additional reason to raise our glasses a few times, which we did in the pursuit of complete enjoyment of the beautiful day. Dr. Frank was the first winery in the FLX (Finger Lakes) that I visited on my first visit to the region in October 2004 and the vertical tasting of dry Rieslings that Fred poured for me that day made a big impression upon me. Although we also tasted a couple of the Chateau Frank sparkling wines it was some years before I realized that they were some of the best products of this category in the region and the US, period. It’s easy with hindsight to say that the region was predestined to produce sparkling wines, because of the crisp, light and aromatic personality of the FLX wines, but if we turn the clock back more than 30 years this was not obvious to the region’s winemakers. It was a daring move by Willi Frank, Fred’s father and Konstantin’s son, to begin the production of Champagne style sparkling wines using the three vinifera grape varieties planted in that region: the white Chardonnay, and the red Pinot Noir and Pinot Meunier. Although we sadly couldn’t taste that first wine, the 1999 Brut was still in pretty good shape for a sparkling wine of 15 years age. However, I think the current vintages of the Blanc de Noir (Pinot Noir plus some Pinot Meunier), 2008 and 2009 are considerably superior to it and a genuine alternative to some elegant Champagnes costing up to double the price. Although it is the largest production run at Chateau Frank and has won stacks of gold medals at major wine competitions, the Célébre sparkling Riesling is still not nearly well known enough. The reason for this is perhaps, that it is not “Brut”, that is it has more than 15 grams per liter / 1.5% unfermented sweetness, and the wine scene wants “Brut”, better still the even drier “Extra Brut”. The idea that the drier a sparkling wine is analytically the better it is is one of the international wine scene’s deeply ingrained prejudices. The truth is that if a sparkling tastes as good as Célébre does (those juicy but delicate white fruit aromas and flavors!) then it does so because it has enough, but not too much, sweetness. 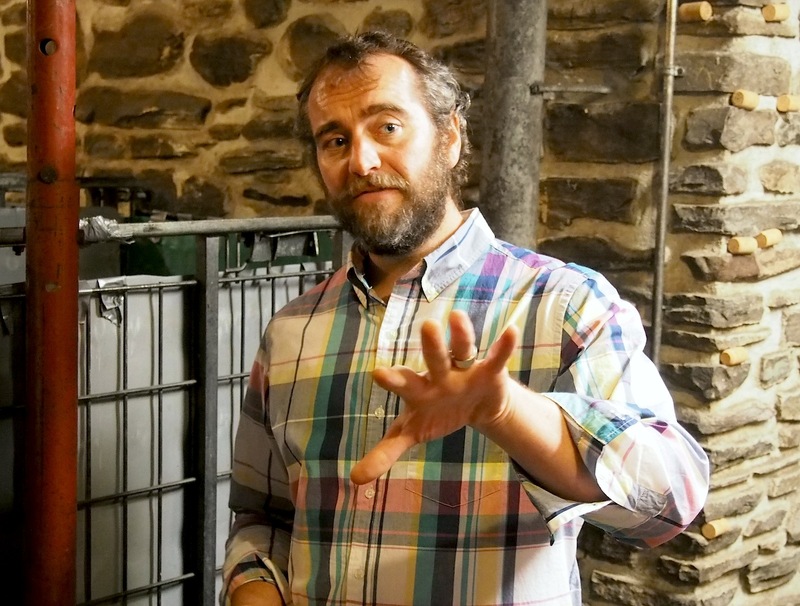 The racy acidity of FLX Riesling demands more sweetness (and less aging on the yeast) than the sparkling wines made from the Champagne grape varieties do. It is extremely attractive in an entirely distinctive way, and this special balance is part of that. Another prejudice of the wine scene is that sparkling wines must imitate Champagne if they are to be any good. A glass of Célébre is the best argument I know against this prejudice!